Darkening of snow from more dust storms in warmer Colorado Rockies 'just pushes on gas pedal for snowmelt'. 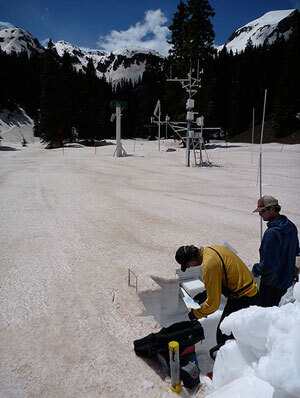 Dust on the snowpack enhancing snowmelt rates in Senator Beck Basin, San Juan Mountains, CO, May 2013. Photo credit: Dr. Jeffrey Deems. He’s describing dust storms – layers of windblown particles that are landing on mountain peaks and leaving them coated with a dark layer of sand and soot. As anyone who has sat in a car with black upholstery on hot summer day will attest, black objects absorb more heat than lighter ones, so by the darkening the snow, it’s melting it faster. Deems explains that “If you put dust on the snowpack, which enhances the absorption of that solar radiation, then that just pushes on the gas pedal for snowmelt.” In a recent study looking at the Rocky Mountains of Colorado, Deems and lead author Tom Painter of NASA found that the amount of dust on mountain snowpack will control how fast rivers rise in the spring regardless of air temperature. And the more dust there is, the faster the runoff. The particles are carried to the Rockies by winds coming from the Southwest when deserts are drying out. The dust events are frequently on the leading edge of a storm and can be pretty dramatic – closing interstates and making it hard to see and breathe. The dust will get deposited in the mountains and quickly become buried by fresh snow, but Deems explains that the sun can see through about a foot of snow, so if it’s greater than 12 inches (30 cm) of new snow, then that dust is just buried, lurking in there waiting for the melt season to arrive. The dust storms mostly happen in the spring, so the particulates tend to be near the surface of the snowpack and are deposited in a series of layers. Once the runoff season starts, the snow will melt down and then hit a layer of the dust. The water will drain away, but the dust piles up making the surface darker and darker as each layer is revealed. This darkening supercharges the melting, and the pattern continues until the snowpack is gone. Chris Landry and Andrew Temple of the Center for Snow and Avalanche Studies measure dust effects on snowmelt in Senator Beck Basin, San Juan Mountains, CO, May 2010. Photo credit: Jeffrey Deems. The problem is getting worse because there’s more dust than there used to be because of less rain with a warming climate and more land development that’s exposing bare soil. Those soil surfaces are naturally armored by crust – lichen and moss combinations that make this black armored surface. Those crusts are virtually impervious to wind erosion. They’re very strong – except when they’re crushed. Beginning back in the mid- to late-1800s, soil started getting disturbed by people grazing animals. Since then, Deems says, we’ve got a wide array of disturbance agents – recreational activities, oil and gas exploration and development, suburban development, dry land farming, etc. All of these activities disturb the soil crust and make the fine grain substrates available for wind transport. And there are various climate change components. As we continue in this warming and drying trajectory in the Southwest, plants that might have anchored the soil are less likely to get the water they need to germinate and grow. But the study doesn’t suggest that air temperature can be ignored. It contributes somewhat, but Deems says their research finds that dust is the dominant force shaping the pace of spring runoff. Also, temperature does control whether precipitation falls as snow or rain, so ultimately it regulates how much snow there is to melt. All of this has important implications for water managers. The snowpack is Colorado’s biggest reservoir, holding way more water than surface storage. If it runs off faster, it can be a challenge to store it all. And, in order to have water available for later in the summer, it’s vital that the snowpack stick around for as long as possible. Water managers watch spring runoff to decide when – and how much – water to allocate to users, to store or to release from dams. Deems says that if we shorten the snowmelt period by increasing that rate, they’ll have a much narrower window of time over which to make those decisions. So, what can be done about the dust? Studies have shown the soil crusts can regenerate if left alone, but land use development along with drier conditions because of climate change could make that recovery tougher. Reprinted with permission of H2O Radio (original posting).